not the one in Chinatown! 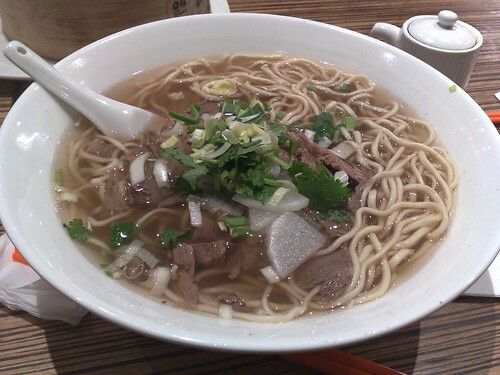 Thankfully, the Box Hill David and Camy’s Noodle Restaurant is another matter altogether. A few months ago as a treat whilst catsitting, three of us headed out and of course ordered far too much. 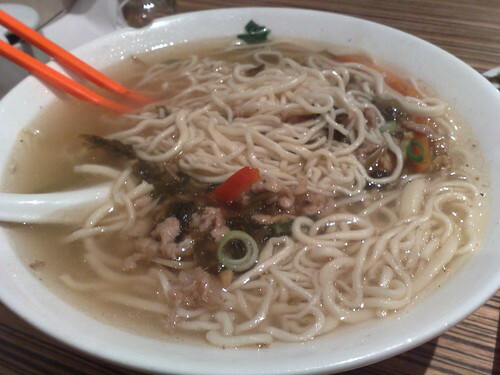 In fact, one of the dishes we ordered didn’t come. Thank goodness for such small mercies! Of course, David and Camy’s was packed. The Box Hill one looks a good deal less seedy but yes, the service is as…efficient. 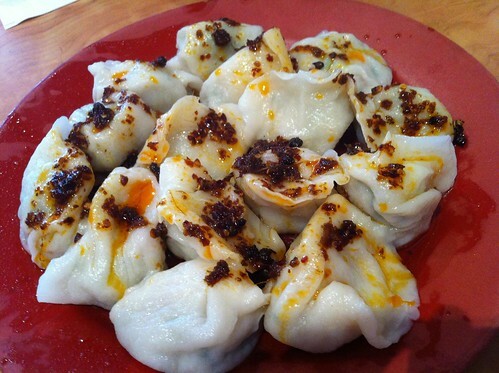 Let’s face it, we come because they give us good, cheap, reliable dumplings. But god, what ones to order? I guess it makes sense to go fried, steamed, vegie and meat in some combination, right? Behold, steamed pork dumplings with chilli oil, nom. 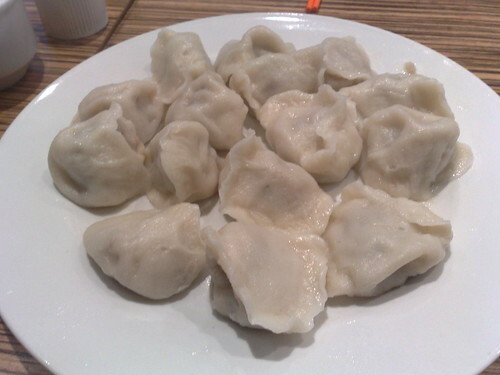 I absolutely love steamed dumplings with thick skins. Hit me up! Under pretense of ‘health’, vegetable dumplings. Don’t worry, they’re fried, so that cancels out the vegie goodness, hehehe. And what these beauties look like inside. Damn, they were (temperature) hot! So don’t be too tempted to inhale them. You will get burnt. 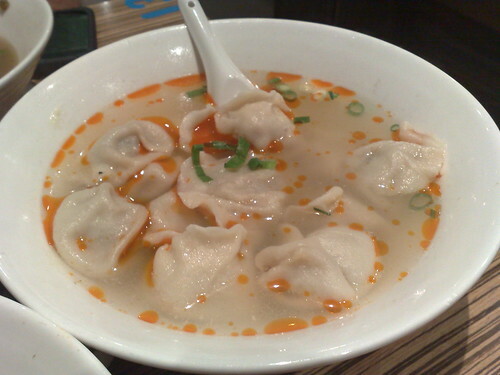 The last dish, the dumplings in chilli oil, was what truly defeated our stomachs despite the amount of generally digestive-aiding Chinese tea drunk. I think Tristan really took one for the team and with considerable effort demolished them when me and K could not. An excellently cheap late lunch and boy did it ensure I didn’t need dinner. You can roughly expect to pay about $10 a person, maybe $15 if you’ve gone all out. Bargain basement meal: achieved. 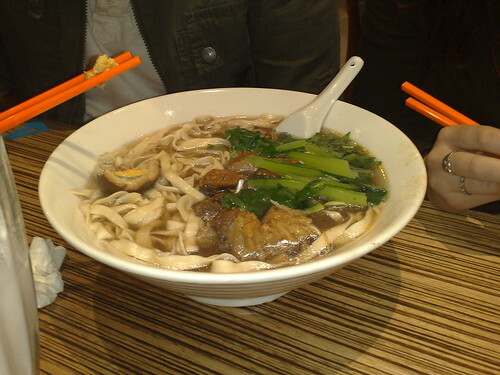 This entry was posted in eatie-foodies dining out, what has gone before and tagged Box Hill, David and Camy's Noodle Restaurant, dumplings, Melbourne, Shanghainese cuisine on August 4, 2011 by gem. Tristan’s work hoes, as he affectionately calls them were expressing some sort of spectator envy over his wine-and-dine escapades. He therefore directed them to hush, and pick a day when they were all available for some good nosh and we’d all go out for a meal. 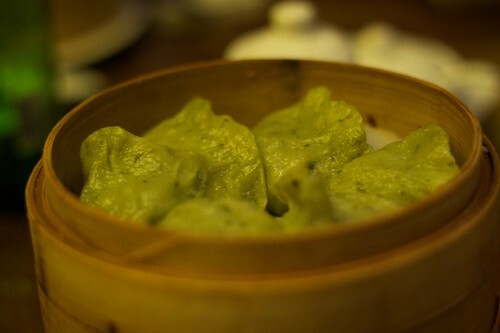 He chose HuTong Dumpling Bar. Of course, he left it too late and the CBD one was all booked out (though former EDSer Ryan reviewed that here). I saved our arses and we ended up with a booking at the Prahran one, though politely informed we’d need to vacate by 8pm. Somehow, I was given the task of choosing food for all of us. Gulp. I’d sent a quick text message to fellow foodie Alex to ask what the must-haves were en route to the restaurant. Like duh Gem. 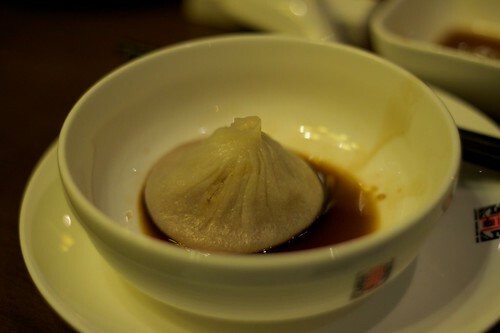 No one but no one goes to HuTong without sampling their much fussed-over shao-long bao. 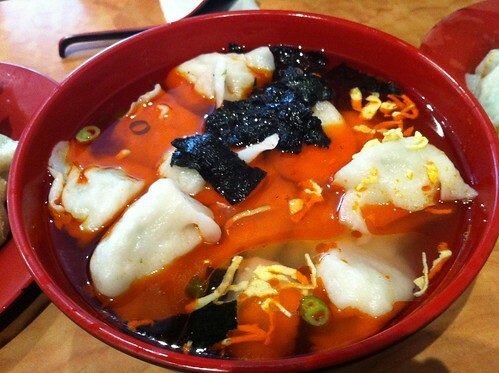 Reminiscent of snow hats with the pom-poms at the top cut off, these unassuming morsels hold a gelatinous broth as well as meat. Be careful when you bite into these! You may get burnt. We made sure we ordered plenty for our table of six and they went down a treat. Appetites suitably whetted, grins on our faces and excellent conversation a-flowing, more delicacies in dumpling form followed. 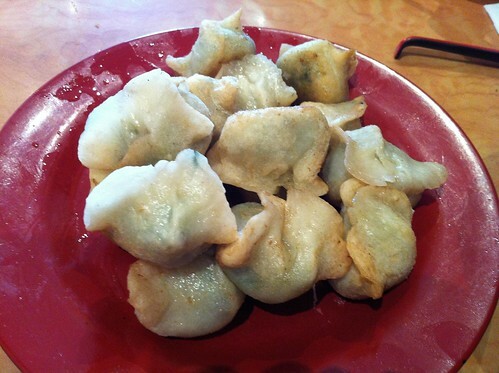 For variation, we got some vegetable dumplings. 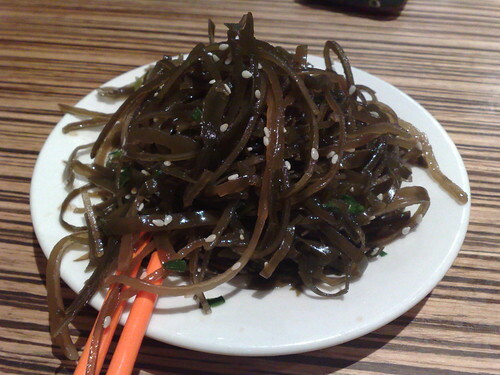 A common complaint with meatless food is that it’s tasteless to the more voracious carnivore. These subtly green-tinged parcels were aromatic and flavoursome, featuring a delicate combination of ginger and mushroom. 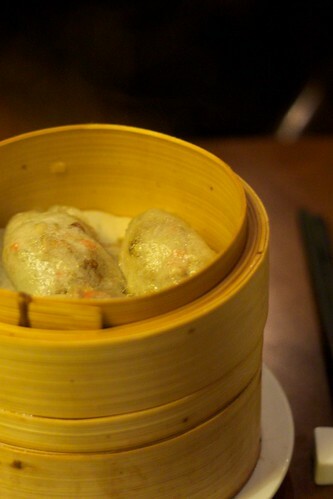 D also suggested we get some Peking duck dumplings. As if anyone would veto that idea! I love that the slightly translucent skins hint at the tastiness encased within. For mains, we shared a trio of dishes and decided to cover our omnivore bases by ordering one seafood, one red meat and one poultry dish. I chose the tea-flavoured diced beef. 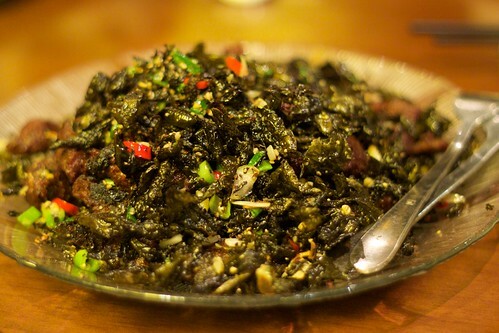 Smoky, crunchy but perhaps could have done with a bit more beef and a little less salt. There were loooooooots of tea leaves left after we fished out the meat! 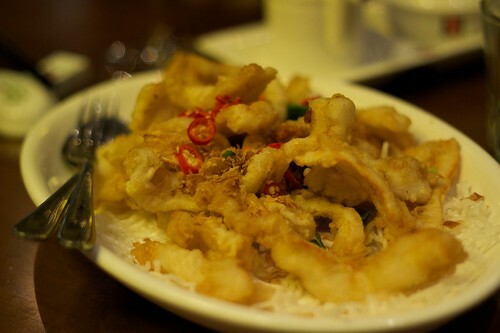 Next up, deep fried salt and pepper squid, cooked perfectly and seasoned with sliced chilli. Lightly battered and fresh, but nothing supremely exciting. 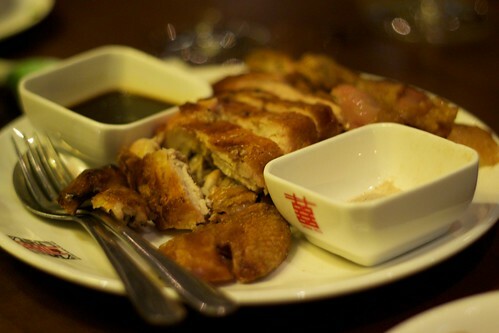 The best of the mains was probably the Shanghai braised chicken in tea flavour. There was some debate about choosing this given one of our mains was already ‘tea-flavoured’ – however, this was very different to the diced beef dish. 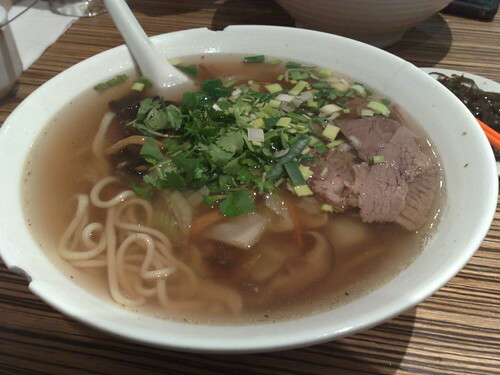 The meat was supremely tender, the tea flavour very subtle and there was five-spice to season to your taste. I think L might have been responsible for making sure we ended up trying this, whee! 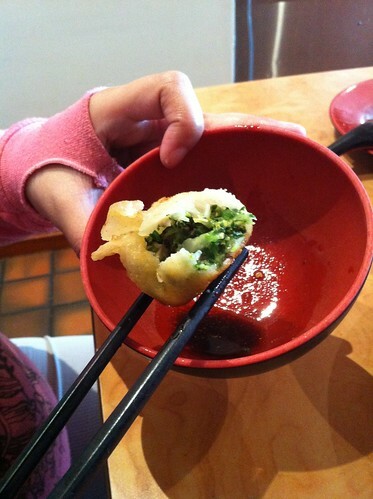 HuTong Dumpling Bar in Prahran is right next to the gleaming boutique Cullen Hotel. The restaurant is spacious and you can even have drinks at the front bar as you wait for your table. It seems common to complain about the service, but none of us experienced anything untoward on the night we all dined – the staff were helpful and friendly despite it was pretty darn busy. Our meal came to a happy conclusion at quite some time before we were to be ‘booted out’ so to speak, but we did not feel pressured to leave in a rush (wish I could say the same for MoVida!). Here’s hoping there’ll be more future dining antics with T’s work hoes and their beaux! This entry was posted in eatie-foodies dining out and tagged Chinese food, dumplings, HuTong Dumpling Bar, Melbourne, Prahran, The Cullen Hotel on September 8, 2010 by gem.